The current build on itch is a pre-alpha build of the game and is still in development. You can follow us throughout our development of the game from our website. 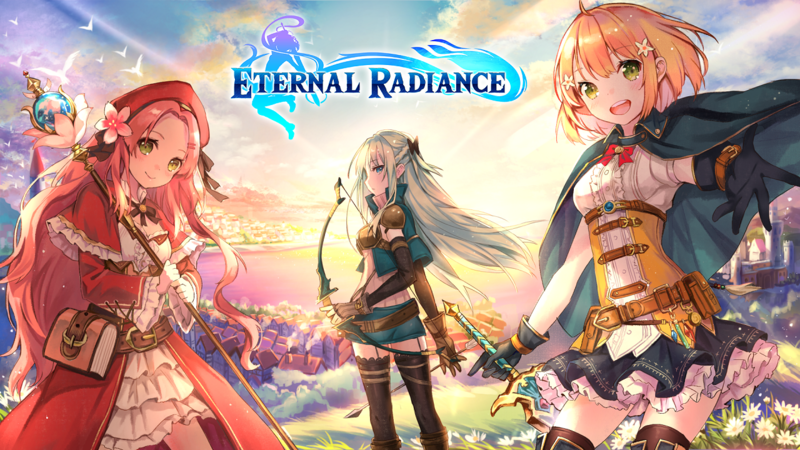 Inspired by classic action JRPGs, Eternal Radiance is an action role-playing game about a squire named Celeste who begins a journey to prove herself worthy of becoming a true knight. Her quest takes her far from her home, across the continent in pursuit of a thief whose actions stem from a sinister plot. Character-Driven Story – As Celeste travels across the continent with her companions Valana and Ruby, they’ll learn more about the world and its history, as well as a sinister plot about to unfold. Exciting, Dynamic Battles – Take on a variety of enemies with an exciting action combat system. Plan your battles, unleash special attacks, and devastate your foes. Beautiful, Mysterious World – Explore fields, towns, and dungeons across a strange world still haunted by its elusive past. Customization – Use an expansive talent tree to customize Celeste’s fighting style. Quests – In addition to the main story, side quests and optional activities allow you to further explore the world and characters of Eternal Radiance. Dig deeper into the lore, help the people you meet, and join your party members as they resolve their personal struggles. Party Interactions – The three main characters learn and change throughout their journey and humorous banter fills their interactions as they come to know each other. Optional conversations add greater depth to their friendship. Enchanting – Upgrade your gear and boost your skills by enchanting them with magical relics. It's very pretty. Is there a way to hide the UI/text (to just see the background and characters) during dialog scenes? I'd love to get a full view of the lovely art. The story looks to have good potential though it's fairly generic so far. I like how the dialog choices allow the player to project some of their feelings into the MC's personality a bit. Games with this level of visual quality usually perform better on my laptop and don't heat it up as much as this one did, but it's fine as it is. I feel like there's too much talking in places, which is made worse by all the redundant dialog from talking to everybody until their indicator changes. I don't want to skip the story, but I also don't want to feel like it's a big wall between me and being able to move around and do stuff in the game. It's too easy to accidentally select dialog choices (though this is how most VNs function). One solution is to make no option selected by default, so if the player is clicking or pressing enter a lot, they don't end up automatically selecting the first option. Another is to disable selection for a fraction of a second after the choices appear. The combat feels kind of "impactless", probably because the way the character effortlessly pushes enemies around and is pulled forward by their own attacks. The pull forward also makes me miss attacks, especially combos. Maybe it shouldn't pull you past whatever you are hitting. I find the guard counter and speed roll timings very difficult to pull off. Enemies have a long tell, but then they attack so quickly that there is still very little reaction time. I feel like mage goblin poison breath might be overtuned. It's a high damage long-lasting ranged unblockable field, and when you have several mage goblins in the area (as well as a bunch of other enemies), it just feels unfair. I also feel like enemies in general dish out too much damage - which would be more acceptable and fun to me if I had a heal spell to help occasionally counter it some. I'm only average at combat like this, so I don't know how much weight my opinions have, hehe. There isn't any way to hide the UI in this old demo version, though there is a keybind to do so in the planned upcoming version. 1) You can skip the dialogue if you want to get to the gameplay, or do fast forward (CTRL), although that isn't mentioned in the demo. 2) I think the current behavior is fine. 3) The lock-on feature is supposed to address this issue, although it isn't in this demo. 4) The guard counter and speed roll timing have been adjusted in the upcoming version already, which makes it easier to perform and have a brief moment of invulnerability. 5) If you hit the ranged goblins, their abilities get cancelled immediately. 6) There will be a heal spell, but it isn't in this demo but u can use potions in this demo build. Thanks for the replies! Concerning the ranged goblins, when there are four of them spread out, spewing poison breath and projectiles (and many other enemies attacking), hitting to interrupt isn't practical. I guess one possibility I haven't tried is to lure some of the enemies away from the group, to fight a smaller subgroup. I'll try experimenting by limiting the number of times the ranged goblins can use the green breathe ability when there are many enemies around which might help with this. I recently played this game and would like to give you feedback on my experience. First of all, absolutely love the artwork and the graphics! Fighting runs and feels really smooth, nice amount of combos/actions to use, so every fight feels different. I felt like it lasted a bit too long.. I feel like there is no real balance between the story and fighting parts in the game. I'm a fan of character development/background, but I think it should be more split throughout the game. You describe the game as being an action role-playing game, but to me it felt more like a visual novel. The interactions with the characters you meet, feel too long and stretched, which prevented me from wanting to talk/explore more in the city part for instance, as I wanted to get to the action. Once you get to the fighting, I feel the same issue. Although the game is beautiful, as stated before, I think the map was way too big. Especially for the first level/quest. I think that, if not immortal like in the demo, it will be very difficult for the average player to proceed. Especially the boss fight. I thought maybe make a small forest part, and replace the boss with one of the giant goblins you encounter throughout the map. Perhaps this was to give an idea of the game later and will change in the full version, in which case I take back my words. That all being said, I will be following the project. I am certainly intrigued, and of course it was just a demo. I'm looking forward to what the final version will have to offer! Like some others, I also made a video on the game, feel free to have a look! Regarding the story, there is a button to fast-forward dialogue by holding (CTRL) which I didn't mention in the pre-alpha build since it is still in development which should be useful in the future if you wanted to get to the action faster. I agree that the map is too big and I have plans to re-work the level design for the first gameplay section in the game. HI! I'm a small little gamer channel but I wanted to mention how much I loved this game because it's so unique and fun. I did get bored a little during the combat because I didn't know what to do or where to go... that was my fault. Enjoy your video! Hi! I just saw this game and I have a question. Is there any character you can romance in this game? No, there is no characters that you can romance in the game. Hi ! I played the demo and this game gave me the envy to play more of JRPG games! I used to play some much of those games and kinda forgot the love I've had for them! The combats where pretty good, and the dialogues as well, keep going! I played through the demo of the game and it looks promising! I made a video with commentary and my thoughts. In the Visual Novel elements of the game, the character designs and backgrounds are very well drawn. The writing and world seems very investing as well. (Although I skipped a lot of that in the video to focus on the action JRPG gameplay.) The action JRPG gameplay has a solid foundation of fundamentals. (Reminding a lot of something like YS8) That being said, there is a need for a lot of improvements with this part of the game. Some of these include a lock-on mechanic and more detail in the environments to explore that (hopefully) tie in with the narrative/world. Regardless, keep up the great work! You guys are still wonderful for creating games and I hope you enjoy this video that I made of me playing this cool new story! Once again thank you! This is my second part of the final review enjoy!! And if you guys like what i do then subscribe!! I recommend everyone to check this game out!! Hey what's Up developer I loved playing Demo Verizon of your guys game so far I loved It. I had lots of fun exploring and talking to different people!! Honestly I really enjoy it!! You guys are great working hard paid of you made it!! My full review will come out tomorrow stay soon ok!! This just part of the game so stay tune. If you guys Love what I do then subscribe ok!! Ahhh; this is only for Windows. Will this ever be a Mac game as well? It'll only be for Windows.